These light, sandy cookies are perfect and easy to make. We added pumpkin pie spices and swapped dried cranberries for the almonds. UPDATE: next year, try the cheese version at bottom! In bowl, beat together butter, sugar, egg, almond extract and vanilla; beat in flour, baking powder and salt. Cover and refrigerate for 30 minutes. 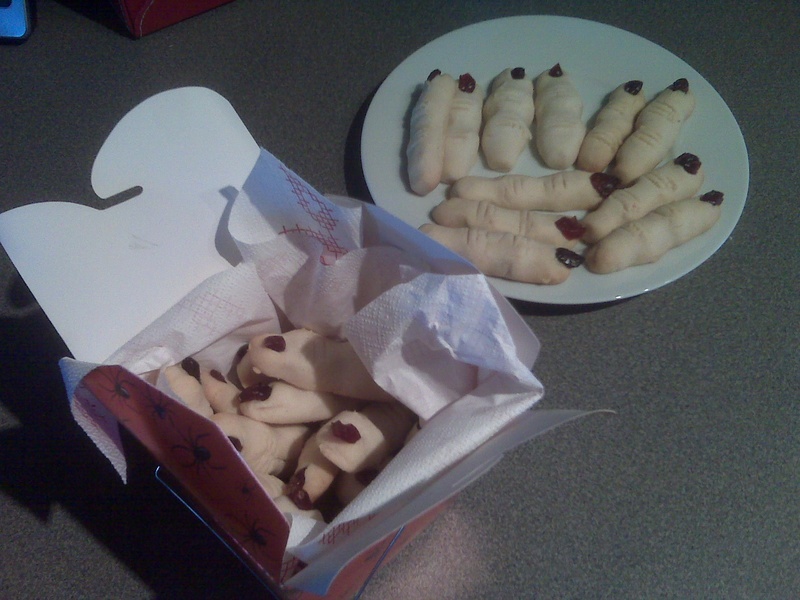 Working with one quarter of the dough at a time and keeping remaining dough refrigerated, roll heaping teaspoonful (5 mL) of dough into finger shape for each cookie. Press almond firmly into end for nail. Squeeze in centre to create knuckle shape; using paring knife, make slashes in several places to form knuckle. 1. Grate the cheese in a food processor. Add the butter, salt, and cayenne pepper and process until the mixture is smooth. Add the flour and pulse until the flour is well-combined. Remove the dough and knead the dough on a lightly floured work surface. Knead the dough until smooth. 2. Divide the dough into approximately 24-36 pieces (I only got 2 dozen out of this recipe because I made my fingers a little larger I think). Roll each piece into a 4-inch finger. 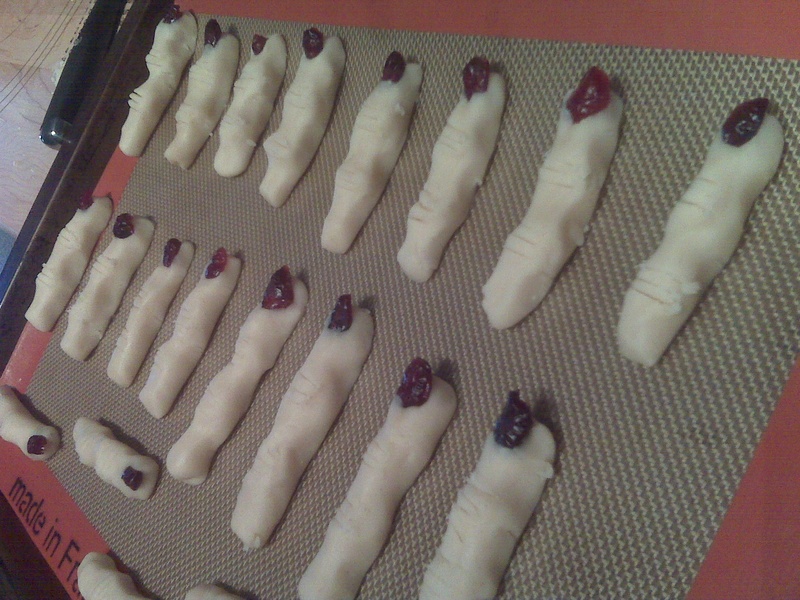 Arrange the fingers on parchment-lined baking sheets. Using a butter knife, make small lines in each finger to resemble the knuckles. Brush each finger with the egg wash. Place an almond at the tip of each nail to look like a finger nail. Refrigerate for 15 minutes. 2. Preheat oven to 350 degrees. If using separate pans, bake fingers on top and lower thirds of the oven. Bake for approximately 25 minutes or until puffed and golden brown. Rotate the pans halfway through. 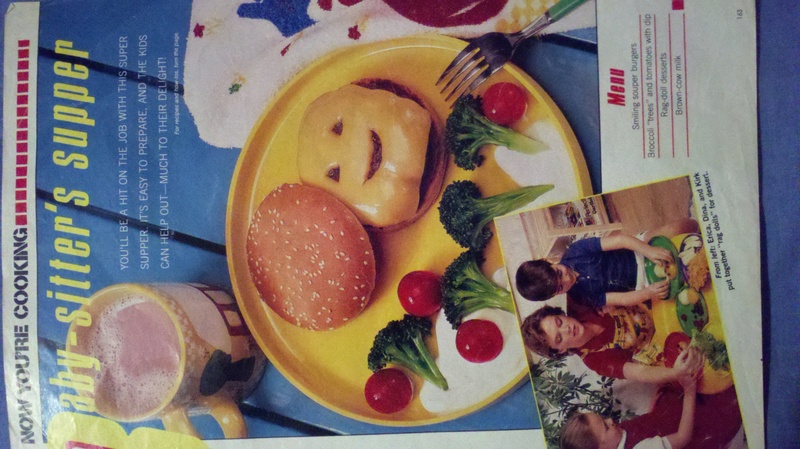 Dinner and a Mooooovie wouldn’t be complete without the things we hold dear: Halloween, burgers, and hoarded Seventeen Magazine recipes. Ack. 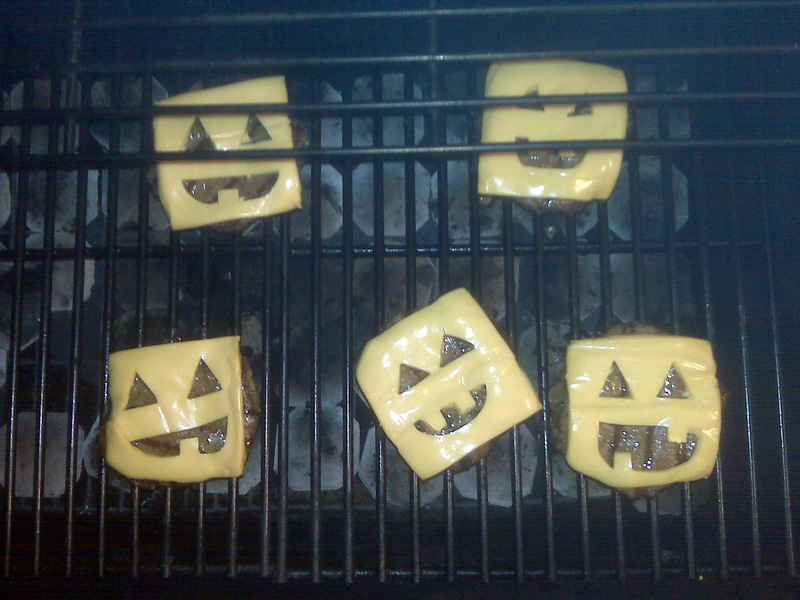 This silliness is from the pages of a silly 80s Seventeen recipe page for babysitter’s supper of jack’o’lantern carved cheese slices (melted on Lipton Onion Soup burgers. All we needed was something fall-like with roasted apple and garlic jam with grainy mustard mayo. Sigh. We love Notable’s monthly burger inspirations, especially this fall number: (7oz naturally raised pork & wild boar patty with double smoked bacon, pickled red onions, housemade black truffle aioli with truffle shavings, homemade foie gras butter (melted unsalted butter emulsified with madeira and maple syrup), oka cheese, local lettuce, tomato on a fresh, house-baked sesame bun with a dill pickle on top). 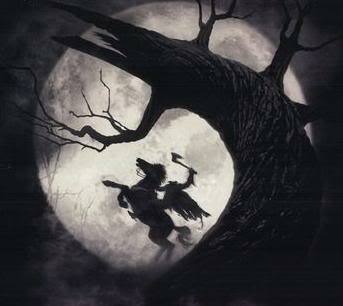 We are excited for another month-long Halloween movie fest, complete with some nibbles of the gothic gourmet variety. Finally time to bust out that Exorcist potager. As for movies, we are keen to keep knocking off classics. 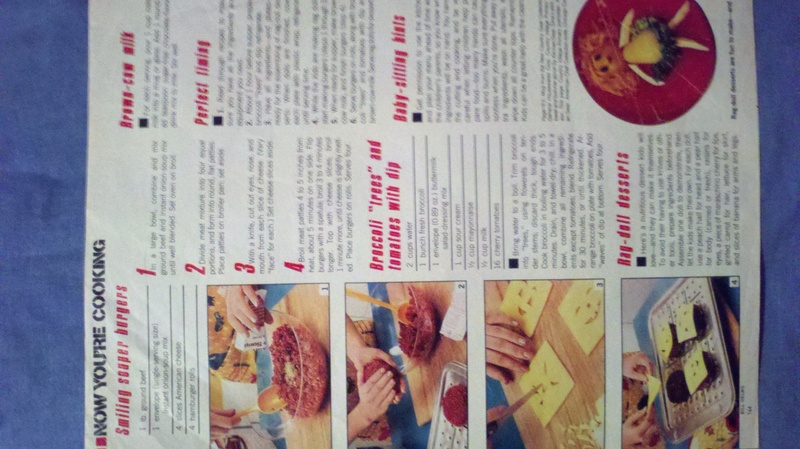 UPDATE: just found a vintage Seventeen magazine recipe perfect for the occasion. Beat together cream cheese, egg, 1/3 c. sugar, 1/8 t. salt. Add 12 drops yellow food coloring and 8 drops of red; blend well. Sift flour, 1 c. sugar, cocoa, baking soda and 1/2 t. salt. Stir in water, oil and vanilla. Fill 15 cupcake liners 1/3 full with chocolate cake batter. Drop one heaping teaspoon of cream cheese mixture onto the top of each. We are obsessed about making some turkey mulligatawny using Thanksgiving leftovers. Homemade stock with the carcass and cubes of turkey for the soup. We added coconut milk, curry paste, apple cider, rice, carrots and celery, but forgot to add lentils or more veggies. Still a delicious variation. This is the first mulligatawny recipe we ever tried. We’ve tried a few, including a Soup Nazi version with pistachios from Top Secret Recipes, but this one is great. Place the flour in a bag and add chicken, shake to coat. Reserve flour. In large pan heat oil and brown the chicken and set aside. Add carrots, onions, celery and apples to pan and cook until soft, add curry powder and cayenne. Sprinkle with reserved flour, stirring for 2 minutes. Gradually stir in chicken stock, return chicken to pot and bring to a boil, reduce heat and simmer 1 hour. Stir in cream and season with salt and pepper to taste. Heating gently over low heat. Do not boil. Spoon over rice and garnish with cilantro. In a large stockpot or Dutch oven over medium heat, melt the butter. Add the turkey and sauté until lightly browned on all sides, about 7 minutes. Using a slotted spoon, transfer to a plate and set aside. Add the onion, celery, carrots and garlic to the pot and sauté until the onion is translucent, about 7 minutes. Stir in the curry powder and cook, stirring, for 2 to 3 minutes more to blend the flavors. Add the broth and browned turkey to the pot, increase the heat to high and bring just to a simmer. Reduce the heat to medium, add the rice and cook, uncovered, until the rice is tender and the turkey is cooked through, 15 to 20 minutes. Stir in the yogurt and simmer for 10 minutes to blend the flavors. Season with salt and pepper. Ladle the soup into bowls, garnish with the cilantro and serve immediately. Serves 4. Mary-Ann Brown, the bright young chef at Calgary’s newest cutting- edge eatery, Turquza, says her “cucina tropical” is different. Cook rice in water until tender and toss with coconut milk, shredded coconut, and salt and pepper. For soup, heat olive oil over high heat and saute garlic and shallots until just softened. Add chicken and apples and cook until chicken is almost cooked through, about five minutes. Add stock and curry paste, bring to a boil, then turn to a low simmer. Simmer about 15 minutes, until chicken is cooked but not dried out. Season with salt and pepper. For each serving, place about 1/3 cup of coconut rice in a shallow bowl and ladle hot soup on top. A little Thanksgiving twist for the unconventional. We don’t have the stones to swap roast turkey for dumplings, but we like the idea of an instant hit of Thanksgiving when the craving hits. 3.In a large nonstick skillet, heat canola oil over medium-high heat. Add dumplings and cook for 30 seconds. Add 1/4 cup water to skillet and cover. Cook until turkey is cooked through, 8 to 10 minutes (12 to 15 minutes if frozen). The secret to Chinese dumpling sauce is that most of it is vinegar (black usually)! Not soy sauce (which is too salty). Then add a little bit of soy sauce and a little bit of sesame oil. The secret to frying potstickers is to put them down on a thin coat of oil in a flat non-stick pan. After they fry for like 30 seconds to a minute, you put in a little bit of water 1/4 cup and COVER the pan. George likes his chicken spicy, and so do we. With an easy velveting technique, this kung pao is a cinch to make. You can easily enhance the sauce by adding mushroom soy or black vinegar. The key here is to cut the chicken into same size pieces, and to chow the peanuts so they are fragrant. This is a very adaptable recipe. Once in a rush, we forgot the velveting part and fried the dredged chicken pieces, removed them only to return them to the pan to finish cooking in the sauce after chowing the vegetables, aromatics and peanuts. Add chicken to a bowl of 1 tablespoon of soy sauce and cornstarch and mix well. Set aside. In a small bowl, mix the remaining 2 tablespoons of soy sauce together along with the sherry, sugar, vinegar and sesame oil. Set aside. Pour the cooking oil into a cold wok or stir-fry pan and add chilies. Heat pan over medium-high heat and stir the pepper until they turn dark brown. Add the peppercorn, garlic, green onion, and ginger root and stir for a few moments. Add chicken and stir quickly for about one minute. Add sauce, peanuts and the thinly sliced scallions. Turn heat up to high and stir for about 45 seconds until well mixed. Remove the chilies and ginger. Serve hot.